Meitaicarrier.com, LLC - A Work-at-Home-Mom Business! Mei Tai Carriers are the most comfortable way to babywear for newborns through preschoolers. The waist and shoulder straps evenly distribute your child's weight and minimize back pain. Mei tais are easily accommodating for all sizes and ages of children, as well as all heights and body types of moms, dads, and grandparents! Welcome to the brand new MTC Deluxe Summer Carrier! 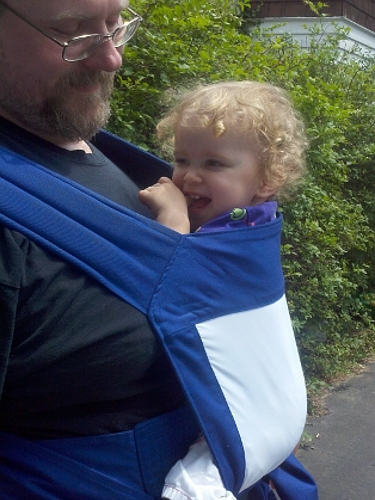 If you're like me, baby-wearing during the summer can be especially brutal. Not only is the sun beating down, but body-to-body contact in the heat and humidity can make things uncomfortable for both you and your little one. The MTC Deluxe Summer Carrier was designed with a light and airy Solarweave center panel to help keep you and your treasure cool while still enjoying the sun. Click on the image to visit my HyenaCart, where you can see this and other great carrier choices! Want more info on MTC, or babywearing in general? Visit the links below! WE'RE MOVING!!! And that means super-big deals FOR YOU! Copyright © 2011 Meitaicarrier.Com, LLC. Site template by Jonas John.